The Arca di San Domenico (Ark of Saint Dominic) is a monument containing the remains of Saint Dominic. It is located in Dominic’s Chapel in the Basilica of San Domenico in Bologna, Italy. The elaboration of this artistic masterpiece was performed in separate stages by the best sculptors of their time and took almost 500 years to finish. Saint Dominic died in the convent of the church of San Nicolò delle Vigne on 6 August 1221. He was buried behind the altar. The church of San Nicolò was expanded into the Basilica of San Domenico between 1228 and 1240. 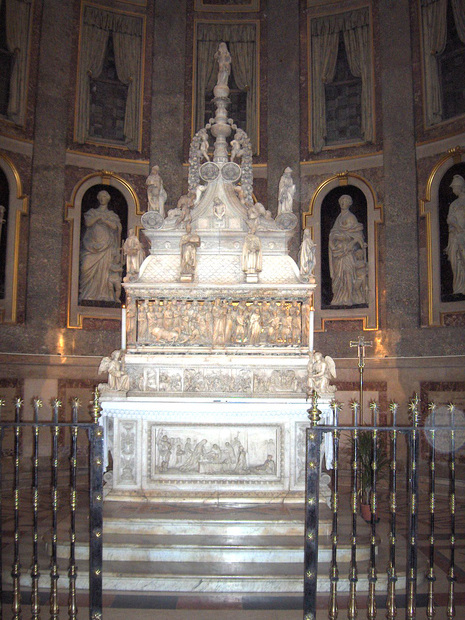 The remains of the saint were moved in 1233 from its place behind the altar into a simple marble sarcophagus, situated on the floor in the right aisle of the church for the faithful. Since most of the pilgrims, who came in great numbers to see the grave, were not able to see this shrine, hidden by so many people standing in front of it, the need was felt for a new shrine. 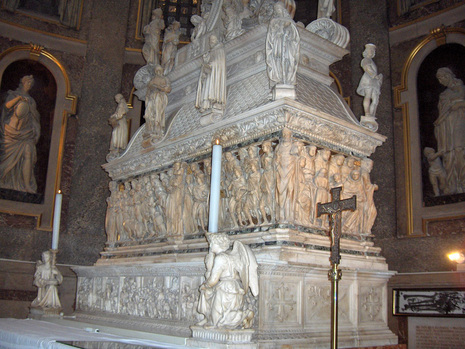 In 1264, the Dominicans then commissioned a new tomb for their founder to Nicola Pisano, the famous sculptor of the pulpit of the Pisa Baptistery. He was certainly responsible for the design of the new sarcophagus, but in 1265 he was already at work on another assignment, the pulpit for the Siena Cathedral. The front side was done in his workshop, partially by Nicola Pisano himself but mostly by his assistant Lapo di Ricevuto. The rectangular sarcophagus was originally borne on caryatid figures. When the Ark was later redesigned, these supports were dispersed and are now tentatively identified in several museums: the archangels "Michael" and "Gabriel" (in the Victoria and Albert Museum, London), the statue "Faith" (Louvre, Paris), a group of three deacons (in the Bargello, Florence) and a similar group in the Museum of Fine Arts, Boston. The sarcophagus was relocated in the middle of the church in 1411. Between 1469 and 1473 a crowning was added on the flat top of the sarcophagus by Niccolò dell'Arca and several other masters in their art, among them the young Michelangelo. 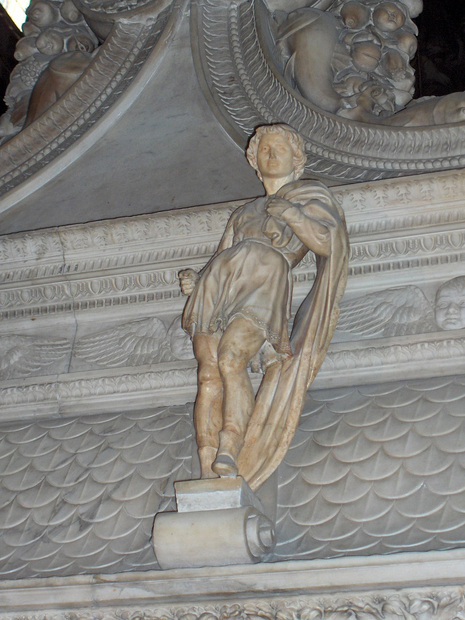 In 1532, a step was added between the sarcophagus and the altar slab by Alfonso Lombardi. The Saint Dominic’s chapel was built by the Bolognese architect Floriano Ambrosini from 1597, replacing the small gothic chapel from 1413. The Dominicans wanted a chapel for their founder to match the splendour of the other existing chapels. The fresco on the cupola of the apse St. Dominic’s Glory, a masterpiece by Guido Reni, painted between 1613 and 1615, matches the artistic value of the underlying Ark of St. Dominic. Finally the whole tomb was put on a marble altar in the 18th century. In a little chapel, on the back of the tomb, is the golden reliquary with the Head of St. Dominic, a masterpiece by Jacopo Roseto da Bologna (1383).